This is one of the kielbasa recipes I remember my mom making, especially for a crowd or a party. And I know other families growing up that had some variation of this style. But a couple weeks ago, I was in Pittsburgh visiting my Dad and decided to do some cleaning out in the kitchen to get rid of things he won't use or need and perhaps salvage some things for myself. I took a spin through my Mom's cookbooks and had flashbacks upon finding this one. Where do I begin? First of all, the name says it all, Babushka Power. Yup, this compilation community cookbook from 1976 is filled with recipes from Polish, Solvak and Russian grandmothers of the babushka-era, complete with old-fashioned directions ("When pressing, a concrete block set on top of pan helps to press it. "), ingredients (1/2 cup oleo), and credentials (Mrs. Larry Lauffer). Second, it was compiled by my grandparent's neighbor from when my mother (and later, I) grew up. Here name was Barbara Ann Dyson and she gathered recipes from all over Pittsburgh to build this cookbook and raise money for the Allegheny Valley School for Exceptional Children. And third, the book was illustrated by my uncle, Richard, who I believe was in art school at the time. Richard put a babushka on everything--from the hen depicting chicken dishes to the elbow macaroni representing the pasta chapter. I love it! I went through every page the night I found it, something I don't think I've ever done, despite seeing my mom pull it out year after year when she would make kolaches and perogis. Some recipes she didn't need to open the book for, like dumplings or halushki. Moral of the story is, I don't know where to give credit for this recipe. Was it my mom's, that I just knew this is how you make kielbasa? Or did she learn from Mrs. Mildred Koty, Economy Borough, PA, on page 70? Or someone else, even? Ultimately, I'll just give credit to Pittsburgh and the babushka heritage I love that's always delivered delicious recipes that remind me of home, wherever and whoever that may be. This recipe makes a lot, so you can adjust, or double it up if your having a big party, because people will gobble this up. I used a mix of turkey and beef kielbasa, but use whatever you like. As for the beer, you need good flavor. This time I opted for a golden ale, Shipyard Export, that Dave and I had leftover from a trip to Maine, but you can absolutely go darker or use a strong lager. If you want a little more sour taste from the sauerkraut, scale back the brown sugar because there is a distinct sweetness here. Make, share, enjoy. Babushkas wearing optional. In a medium sauce pan, heat beer and brown sugar over low to medium heat until sugar is melted and it starts to simmer. Simmer for 5 minutes, then remove from heat and let cool slightly. Cut kielbasa as desired and arrange in the bottom of a 4 1/2 quart crock pot. 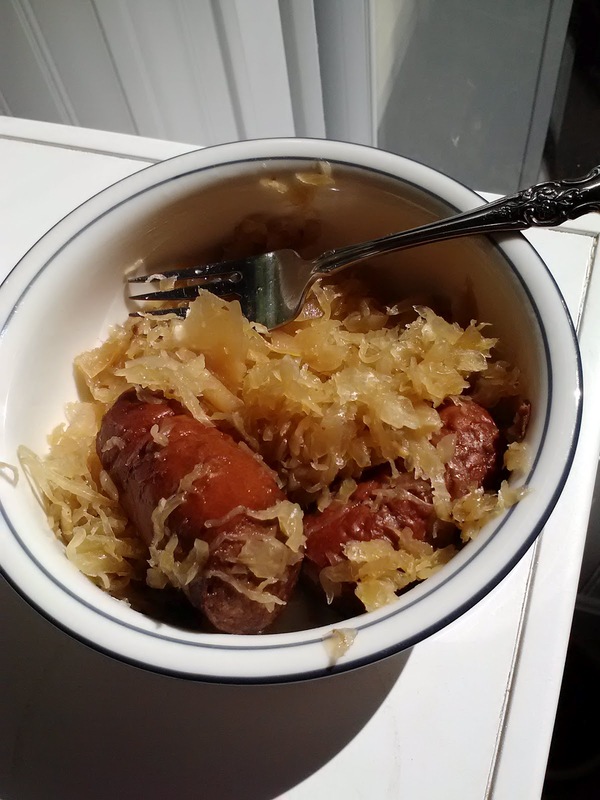 Add sauerkraut to crock pot. Pour cooled beer mixture over sauerkraut and mix slightly. Cover and cook on low for 6-8 hours. Note: The longer it cooks, the deeper the flavors. Serve on sub rolls or just in a bowl. Where can I get a copy of babushka power cookbook?